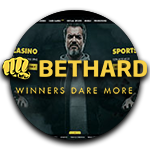 Bethard is one of those casino’s to keep a n eye on, in the best way possible. They’re fairly new in the online gaming world compared to some of the giants as they launched in 2012, but nonetheless are growing rapidly. Time to put them to the test! The registration process went very smooth and quick. The usual personal details such as phone number and email address are required, but nothing surprising. What’s definitely a plus about the sign-up process is that you’ll receive a verification code on your mobile phone. No one likes to have to go back and forth to their email address to activate their account, and this handy feature eliminates this tiring step. Simply enter the code you’ve received via text and voila, you’re in! Bethard truly has an impressive welcome bonus for newcomers. They offer several bonuses for a total of 4 days in a row. The free spins that will be added can be used on some very popular slots: Starburst, Attraction, Lights and Pyramid: Quest for immortality. Day 1 – Player will receive 100% deposit bonus up to €500 and will also receive 50 free spins. Day 2– Players will receive 50% deposit bonus up to €250 and will receive an additional 150 free spins. Day 3– Players will receive 200 free spins when they deposit €25 or more. Day 4– Players will receive 250 free spins when they deposit €25 or more. Neteller – an e-wallet solution. You can create a Neteller account within a few minutes and then top it up via many payment methods. Once you have deposited money in your Neteller account you only have to enter your Netelller account and Secure ID to make a deposit. Credit card – Good old fashioned card payment. No need to further explain this one. Skrill – also an e-wallet solution. It works very similar to Neteller however in this case you’ll log in to your Skrill account in the payment window by entering the email address and password of your Skrill account. Paysafecard – this is a very popular choice among players who’d rather keep everything anonymous. It’s a type of prepaid card option and you can buy the paysafecards in stores all over the country. The card will have a 16 digit PIN which you’ll have to enter to make a deposit. There are five buttons located in the left top corners of the site which allow you to navigate to the different sections of the site. The first is the sports section. The page shows ample information whilst maintaining a clear overview and convenient menu’s and links. Quick links allow players to navigate swiftly to favorites such as Tennis, Champions League and the Europa League, whilst you can also easily search per sport or Today’s Events. The second button directs you to the Live Betting area with a foolproof lay-out so that you can quickly place a bet on your favorite match. The third button will allow you to enter the Live Casino area where you can find an array of live games. We’ve counted and you can choose from 9 Roulette tables, 33 Blackjack tables, a Casino Hold’em table, 4 new Baccarat tables and an Ultimate Texas Hold’em table. If you prefer regular casino games and slots you won’t be disappointed either. The Casino area has 45 slots, 30+ jackpot games, 6 live tables, 17 blackjack tables, 15 roulette tables, and an array of other games such as Poker, Punto Banco, and Baccarat. Last but not least there’s a Virtual Sports area where you can bet on several sports such as virtual soccer, greyhounds and horse racing. As usual we’ve done a quick test to see how their support team works. We’re pleased to say that Bethard’s support agents are trained exactly how we imagine a good customer service team should work – quick, correct and polite. We had the pleasure to speak to Maria who swiftly answered our questions and was very friendly. After reviewing Bethard we can now say with certainty that there’s a good reason why Bethard is growing every day. The site is slick, we haven’t experienced any lag, and they have various handy features which make playing at Bethard a very pleasant experience. But most importantly, they offers an abundance of choice to everyone who signs up – which we recommend you do.